This photo of a Crooked Gap Farm Bone in Pork Rib Roast was prepared and shared by Brett McClavy. Looks delicious!! Add some BBQ sauce to your pulled pork and get a tasty BBQ pork sandwich. This BBQ pork sandwich was made from meat from a shoulder roast which was slow cooked in a crock pot (8+ hours on low). Other cuts that work well for BBQ pork are shoulder steaks, uncured hocks (shanks), and fresh ham roasts and steaks. Each of these would be cooked similarly. 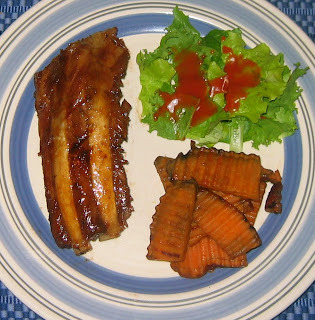 This photo and recipe of our CGF ribs is courtesy of Miles Jascha, co-author of Savory and Sweet. Combine all ingredients together and and transfer to an air tight container. 1.Generously sprinkle rub on ribs and massage into the meat. 2. Preheat smoker or grill to around 165-185. Put the ribs bone down on the grill and smoke for 3 hours. Every hour spritz some apple juice on the ribs (helps keep them moist). 4. After smoking for 3 hours, wrap the ribs in heavy duty foil and put back on the grill. Raise the temperature to 225 and cook for 2 hours. 5. 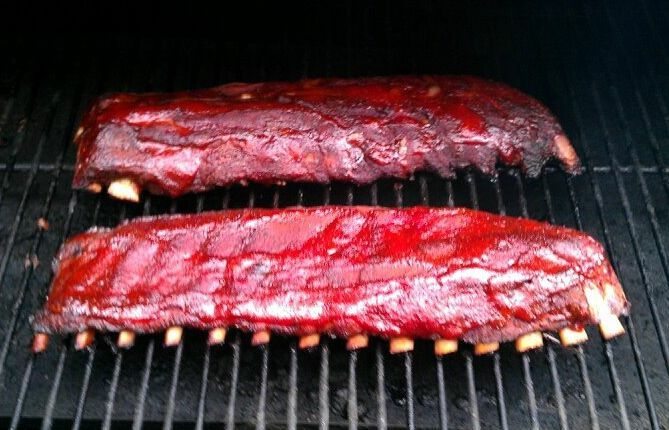 After the 2 hours are done pull the ribs out of the foil and place directly on grill and the 225 degrees. Using your favorite BBQ sauce spread onto the ribs and continue cooking for 1 hour. The BBQ sauce will make a nice sticky glaze. Let rest for about 10-15 minutes and serve with your favorite BBQ sides. 1. Combine all in a sauce pan. Bring to a boil and then turn heat to medium low. Simmer for 20 minutes. 2. Let cool for 5 minutes and then puree with a blender or food processor. 3. Return pureed sauce to pan and bring to a simmer. It is now ready to be painted onto ribs. This recipe and photo of our Crooked Gap Farm pork hocks (shanks) was shared by Christine Ano-Larson. Christine says, "I must say, it was the PERFECT fall dish. Here's the recipe I sort of followed in case you want to give it a go. It's AWESOME!" eight small red potatoes, quartered. Pre-heat your oven to 300 degrees. Cross hatch the skin on the shank, cutting all the way through the skin and fat, but not into the meat. Melt the butter in your dutch oven and saute the shank at medium-high heat until the skin is crispy and puffed up and a deep golden brown. This caramelizing of the meat, skin, and fat, what is called the Maillard Reaction, will produce a deep and meaty flavor that really makes the dish. Pour off all the accumulated fat and butter and then lower the heat to medium-low and add the garlic and shallots and saute for a minute or so. The tomatoes and all the rest of the ingredients. Turn up the heat to high and bring to a boil. Turn off the heat, cover it, and put it in the 300 degree oven for two hours. 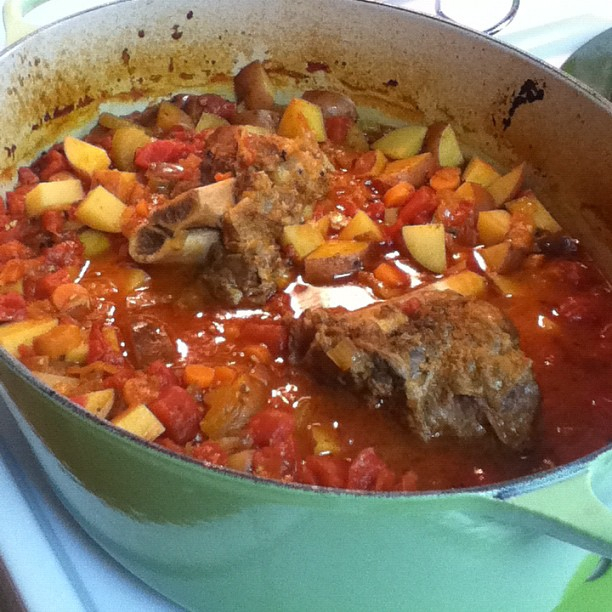 Gently stir the ingredients and turn over the pork shank once every thirty minutes, but otherwise leave it alone. After two hours add the potatoes, submerging them in the sauce/cooked vegetables and cook for an additional thirty minutes without touching it. Plate it on a big serving platter and then pull the meat from the bones and serve. Mmmmm... that looks great. And tastes even better. This is a very rich dish and it actually made enough for three meals which I had over several days. The flavor developed even more after sitting in the fridge and on the third day I was moaning with pleasure as I finished it off. It was so good that I made it again, this time with smoked pork shanks which gave it almost a completely different flavor. Either way it's a great dish. 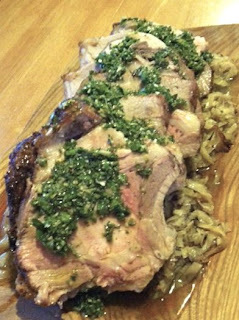 This photo and recipe of our CGF ham is courtesy of Miles Jascha, co-author of Savory and Sweet. Miles says, "This was the most delicious ham I have ever eaten, So much better than some store bought ham that came from a factory where the pigs are pumped up with antibiotics and hormones." Place your ham in the plastic container that you'll be using to cure it and fill it with water until the ham is covered. Remove the ham and then measure how much water is left in the container - this is how much water you'll need for your brine. Based on how much water you have, use this ratio of salts and sugars to water. 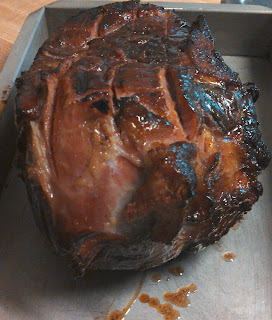 I had a 9 lb ham and had to double the recipe in order to cover the ham properly. Stir into your plastic container water the salts, sugars and pink salt, and place your ham into the brine. Also use a meat injector to put a little of the cure into the center of ham near the bone. I find this helps even the thicker parts to get cured properly. If any parts of the ham bob above the surface of the brine, place a ceramic plate on top to weigh it down. I use a smaller cooler for this. Place the container in the fridge, and keep it there for a span that equals one day per every two pounds. Halfway through the brining process, turn the ham over so all parts of it will be submerged. After the brining is done, rinse the ham and let it soak refrigerated in clean water for 24 hours. When smoking for the last hour use a favorite glaze and glaze ham every 15 minutes.